I’ve done plenty of sessions with one tulle skirt, but never one session with TWO tulle skirts! Alissa took her Paris portrait session to a new level with both a black and a white tulle skirt to make her photos that much more glamorous. This one hour portrait session took place at Trocadero and the Champ de Mars, as well as the area down by the Seine River. Victoria Elena - Your photographs are so beautiful!! I’m drawn to warm tones in my own work and in others, and yours are so wonderfully golden. I love it. I can’t wait until I can see these places in person! 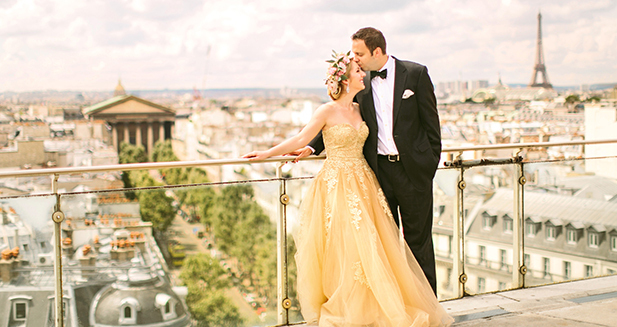 There are just so many details I adore about this lovely elopement wedding in Paris. Megan’s killer Betsey Johnson shoes (with blue soles for her “something blue”) and self-made bouquet, Dylan’s wedding band made out of an old French coin, that romantic and feminine lace wedding dress, the Vera Wang-designed engagement ring, and of course that incredible backdrop. The newlyweds opted for a private, intimate exchanging of vows on a terrace overlooking the Eiffel Tower, then continued with a tour of the city including the Pont des Arts lock bridge and the Louvre. It was such an honor for me to be a part of a wedding that was so genuine and full of emotion. You can just see in their expressions and the way they look at and embrace each other that what they have is true, undeniable love. Here are a few of my favorites from their wedding day!